Let me say this right away: I have never cared for Hemingway’s writing. Everything I’ve read by him has bored me to death. But the editing app that carries his name might be useful. Usually I’m leery of editing apps and programs because I’m an editor, and there’s always the possibility that my job could be taken by a robot or a very smart computer. Then I remember that I am often correcting mistakes made by Microsoft Word’s grammar checker and programs like Grammarly, and I am reassured that my future is secure (well, so far). The Hemingway App also tells you how easy your sentences are to read and whether you have any adverbs, longer words that could be replaced by a shorter word, passive voice, and so on. Like Microsoft Word, it also gives you a counter so you can see what you have in a given document. I’m guessing that the “Read. Time” thingy is how long it would take an average reader to get through the document, which is an interesting feature. The concept sounded good, especially the read time, but after looking at it; I wouldn’t use the app to actually edit. I might use it to develop awareness of adverbs in sentence structure, but maybe not even that. I was curious so I copy-pasted a few different paragraphs written by Ernest Hemingway. If he had used this app, his writing would have been chopped up and entirely changed in order to conform with the app’s rudimentary “eliminate adverbs and passive voice, also split any sentence longer than two lines” policy. Update on my last comment: So, I revisited this editor later today because I like to see my writing in different formats (helps provide a different perspective) and I noticed that sometimes the editor changes from the blunt “Remove it.” as a response to adverbs and passive voice to “Aim for # or fewer” instead… which, makes me more likely to use it because I like the coloring system and the statistics it provides, so if I ignore the situations in which that bossy voice is used, I might use the app for the color-coded change in perspective. That’s true. Sometimes the voice/tone of the “editor” makes all the difference. I gave it a look. You know that feeling when you first meet somebody and you say to yourself almost immediately, “Okay, this person and I are never going to be friends”? Now, occasionally you say that and then the person becomes a really good friend later, but I have the very strong feeling that this is not for me. I’ve been listening to my own judgment for too many years (okay, decades). 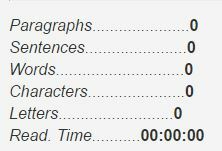 At some point I may try to check some actual Hemingway text and see how it likes that. That’s usually what I think about editing programs/apps in general. I have yet to find one that’s useful.